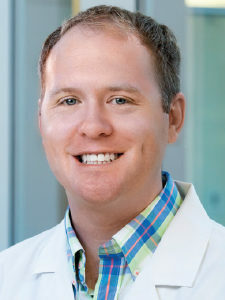 A native Oklahoman, Dr. Eric D. Thomas received a bachelor of science in physiology from Oklahoma State University and holds a doctor of medicine from the University of Oklahoma. He continued his education at the University of Oklahoma, completing his residency in obstetrics and gynecology. During his residency, he received several teaching accolades, including the OB/GYN resident teaching award and the Aesculapian Award for best teaching resident. Dr. Thomas then went on to complete his fellowship in gynecologic oncology at the University of Alabama at Birmingham. The focus of Dr. Thomas’ work and interests lies in novel treatments for ovarian cancer, which target the disease through the use of immunotherapy. He is a member of the Society of Gynecologic Oncology American Medical Association, Oklahoma State Medical Association, and Alabama State Medical Association. Dr. Thomas is certified by MD Anderson Cancer Network®, a program of MD Anderson Cancer Center.